In Today’s world, large number of working professionals belong to IT profession and bloggers too come in this category regardless of their part time or full time blogging. I would like to help you with some very simple and useful tips. And I hope that it will help you all in living better and longer with good health. These problems can be solved by stretching your neck before starting your work and do some simple exercises for your hand, wrist and fingers. Posture is important and you must maintain straight posture. Take breaks in between your work if you are working for long hours. Eye problems are very common. For this you have to avoid sitting long hours before computer or laptop screens. Drink more water to avoid puffiness. Do some eye exercises (refer some exercises related to eyes). You can use anti-glare glasses to avoid strain on eyes. These problems are due to sedentary life style. The only solution for this is to exercise and exercise. Do daily morning exercises for at least 30 minutes or if you have no time you can do it in your working place or office before starting your work. AVOID JUNK FOODS. To solve these problems you must have positive attitude. Have enough sleep and relax your mind by practicing meditation and yoga. This is a very important which must be seriously looked into. People living in this tech world are very easily get carried away by the addictions which are very bad for the health and wealth as well. Learn tips that can help you in avoiding those addictions. Consult your doctor and take counseling. Hope the above mentioned tips will help you to lead a very happy and healthy life. very useful post and every blogger must see this in order to avoid deadly problems due to simple carelessness .... thank you kranthi , looking for more posts like this ! Good information. I'm not sure about addiction other than too much caffeine. Maintaining good posture will help reduce neck, back, shoulder, arm and wrist pain. This scenario is especially true with people that work at home. The constant access to the sofa, TV, and the fridge makes it easy to gain weight over an extended period if you don't exercise. Thank you for the tips on health. Your site is always very useful. Getting enough rest and eating right is also very helpful along with the exercise that has already been made note of. I recently posted 5 Ways that Blogging Can Kill You, this is very much like that post. I think it's important for bloggers to take care of themseleves. Really a good post every and useful also. Maintaining health is very important. While you're busy, you still have to try to get your body stay healthy. Eating a nutritious and avoid unhealthy foods. Do not let illness keep your physical undermined. Thanks for this info. 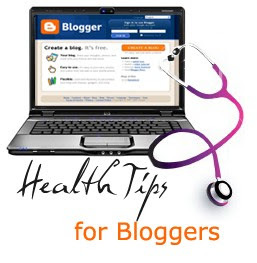 Every blogger should look for this tips. These problems will go on increasing and we must give give importance to health while working on PC. As you said we need to allot at least 30 Min for morning exercises to overcome most of the problems listed by you. When I started going for a morning walk of 5 kms / Daily, I began to lose my body weight and also relieved from the back pain that I was previously suffering for almost 2 years. finally thanks to your tips I get a solution to the eye problems while playing computer .. Useful Information and good tips ..! thank you ..! It is another great post. I want to know one trick that how to set up "link To Us" that you set in your side bar.Thank you. Thanks for the reminder. I've been home recovering from a broken leg for the last few months. I've been at the computer writing (and surfing, I have to admit) way more than I usually do. I finally realized I was having significant neck pain as a result - duh. It may sound silly but I set an alarm to go off several times a day so I remember to get up, stretch and move around. Yes, as a new internet market, sitting infront of the computer had taken its toll on my body. I went back to the gym just last week! Thanks for the easy tips. These simple tips can really make a difference. Many people underestimate the power of exercise and so did I until I've seen people get better faster by implementing simple exercises into their lives. very nice post. I agree with you. The most important is healthy. Without this thing, we can't blogging. I find your Blogger templates very different and nice. In fact I'm using your 'Falken Press' Template for my blog. The above post too was very informative. But, I'm writing here to ask you if you could solve a certain problem - or if there already is a solution for this problem. The problem / my point of view: How can I have one page which appears when my blog url is clicked and when my individual posts are clicked, can I have a page which displays ONLY my post and NOT all the sidebar gadgets? I do remember that once there was something like that. But I'm not sure. You see I like the front page desighn of the Falkner Press very much; but when I have to read my Blog Post I'd like the page to be bigger and without the distraction of the side Gadgets. Just the Ad Banner (the one which comes under the slide show) adjusted to fit the bigger page view, and the Blog post with comments. Please could you get back to me on this? A proper posture is a must for those who work long hours on the computer, may it be in IT companies, or on their own websites or blogs. Ailments like carpel sydrome make it mandatory to take precautions against falling sick with such new generation, computer-usage-related illnesses. Ergonomic office chairs may cost a bit, but it may be wise to get them if one wants to blog for life! Did you tried this hack..? But, if you still can't able to solve the issue from above solution, let me know.... I'll help you. Thank you for your reply. Yes I am going to use the hack which you have written to me. BUT, I found something else ... I am working on it. Let me finish it, I will look up your email id and send my result over to you - you may like it, but i am not sure about whether it will be awesome! To me it is awesome, but its my perception. To you - the script used and the way blogger script has been manipulated might be the one that's awesome. By the way, that template too is something I downloaded; but seriously its not all copy paste!! I am actually gonna try to modify scripts you've used on Falkner Press now to make my latest Template Nightmare Work!!! (Nope that's not the name of the Tempy!) Shall get back to you - I will need your help again in tweaking that template! Very good. This is the first time I read this kind of article. Asallam :) I hope you're done with your exams. And I hope you've done them well. I figured out most of the template problems and I've put it up for my blog. But since its private - send in your email id; I'll send you the invite :) Yea, Not in blogger for the name and fame, I told you :D But its a good habit to say 'Thank you' and well, it was your templates which set me on the right track to get mine done. I've not ironed out ALL the problems. But still ... I think I've come a long way :) Send in your email id - ok? Nice tips to bloggers. I'm newbie anda I need these tips. hay buddy.. I agree. as blogger, i feel that back pain. ermmm.. nice blog ..
nice blog. good work by bloger. keep it up. Your post is very informative. It helps us not only to build our site but as well as our own health. now again i return to grasp some knowledge from this site about a blog formation ..
very nice post,,this is true to all persons,,not just bloggers..but this is definitely effective to reduce my waist flab..